Trekking and travel in Nepal with Maya Devi Trekking! 13 days Everest Base Camp Trek is specially designed to reach Everest Base Camp including Kala Pattar which is the best view point to view the sunrise over the high Himalayas including the Mt. Everest. Starting by flight about 40 minutes from Kathmandu to the small mountain airstrip to Lukla, the heart of Everest Region, then around three hours walk, we reach we reach at Phakding for the first night of the Everest Base Camp Trek then we continue our Trek to Everest Base Camp through north up to DudhKosi valley and to Namche bazaar (gateway to Everest Base camp), where we spend one extra day for acclimatization. We trek to Kala Pattar and subsequently to the Everest base camp. We have one another rest day in Dingboche for some side-trips and for further acclimatization and again we continue our mission to the Everest base camp and the Kala Pattar. After Reaching at Everest Base Camp and having view from the Kala Pattar we retrace all the way down to Lukla and fly to Kathmandu. 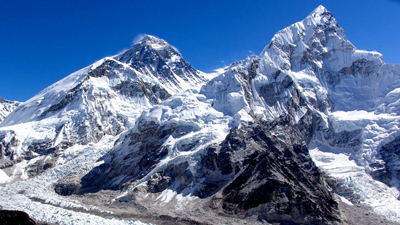 14 days Everest base camp trekking is specially designed for those trekkers who have limited time as well as wishes to climbed Everest base camp. Everest Base Camp Trek another attraction is the culture and the lifestyle of the inhabitants of this region “Friendly Sherpas” who have become very famous in the world as they are the king of the mountains and they have been successful to make many world records in mountain climbing and expeditions. A part from this one can visit the Tengboche Monastery in Everest Base Camp Trek which represents the Tibetan Buddhism and this is the biggest monastery that exists in the Khumbu Region. Day 02: Trip preparation and welcome dinner. (Everest Base Camp) Guide and your domestic flight to Lukla, plus airport tax. (Annapurna Base Camp) Private or public transportation to trailhead. Sightseeing in Kathmandu with a Guide. Travel van or taxi is provided. Alcohol, water, cold drinks, snacks, laundry, internet etc. Helicopter rescue (If needed) ... Rescue insurance is required. Over the past 20 years, Mayadevi Trekking has been connecting travelers with their dream adventures.